The core.async library provides a way to do concurrent programming using channels (eg. queues). It minimises the need to use complex concurrent constructs and worry less about thread management. core.async is written in Clojure and can be used with both Clojure and ClojureScript. LispCast Clojure core.async: Channels - first lesson only. core.async is very widely used withing ClojureScript applications and many libraries are built on top of it. It’s a good example of the syntactic abstractions that can be achieved by transforming code with ClojureScript macros. A channel is a queue with one or more publishers and one or more consumers. Producers put data onto the queue, consumers take data from the queue. As data in Clojure is immutable, channels provide a safe way to communicate between threads. Channels do not include a buffer by default, they use a producer (put!) and consumer (take!) to transfer a value through the channel. A maximum of 1024 put! functions can be queued onto a single channel. 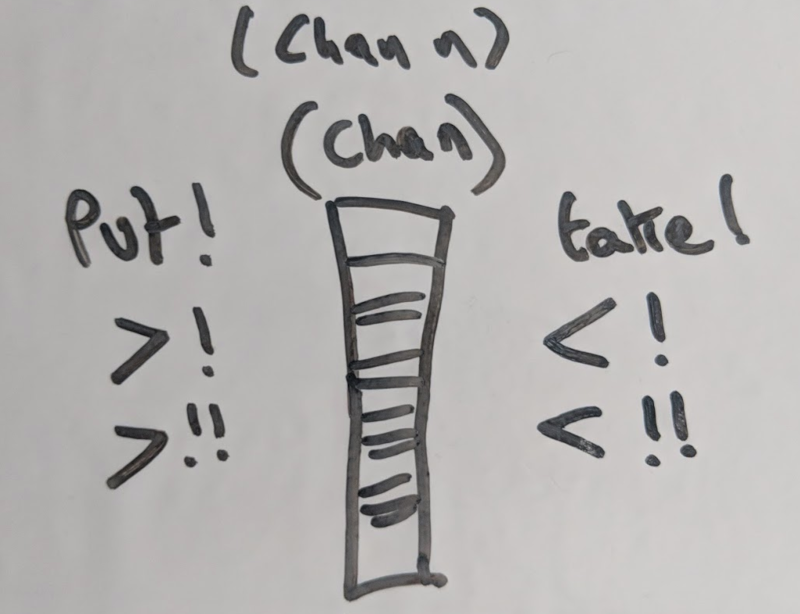 Specify a channel using (chan) or a channel with a fixed buffer using (chan 12). Processes are independently running pieces of code that use channels for communication and coordination. Calling put! and take! inside a process will stop that process until the operation completes. The chan function creates a new channel. A single channel can take a maximum of 1024 put requests. Once it has reached the maximum, then it is considered full. A buffer of a fixed size can be specified when defining a new channel: (def channel-with-fixed-buffer (chan 12)). This buffer increases the number of puts that can be sent to the channel. A dropping or sliding buffer can be used to discard messages added when the buffer is full. Channels can be explicitly closed using (close channel-name) or by adding a timeout that closes the channel after the specified number of milliseconds (timeout 6000). The put! function puts a value (message) on the channel. You can put messages on the channel even if nothing is listening (no waiting take! functions). Evaluating put! will always add a message on to the channel as long as the channel is open and not full. The take! function will take a single message from the queue. The take! function needs an argument that is the channel and a function that will receive any message taken from a channel. Referred to as a go block, the go function creates a lightweight process, not bound to threads. Thousands of go blocks can be created efficiently and they can all have their own channel. core.async offers two ways to write to and read from channels: blocking and non-blocking. A blocking write blocks the thread until the channel has space to be written to (the buffer size of a channel is configurable), a blocking read blocks a thread until a value becomes available on the queue to be read. More interesting, and the only type supported in ClojureScript, are asynchronous channel reads and writes to channels, which are only allowed in "go blocks". Go blocks are written in a synchronous style, and internally converted to a state machine that executes them asynchronously. In this example, let introduces a new local variable ch, which is a new channel. Within the let&apos;s scope two go blocks are defined, the first is an eternal loop that reads (<!) a new value from channel ch into variable v. It then prints "Read: " followed by the read value to the standard out. The second go block writes (>!) two values to channel ch: "hi", it then waits 5 seconds and then writes "there" to the channel. Waiting for 5 seconds is implemented by reading from a timeout channel, which is a channel that closes itself (returns nil) after a set timeout. When running this code in the Clojure REPL (for instance), it will return instantly. It will then print "Read: hi", and 5 seconds later it will print "Read: there".